This is a writing from a personal experience. When I turned twenty-four last year, I felt that my life wasn’t figured out yet and I’m kinda confused of what to do next after the pre-twenties and post-college feels. My twenty three is a transitioning part into a more adult version of myself because it embarks my mid-twenties journey. Twenty – three for me, would surely impact my 30’s. After a year, here’s the twenty-five year old version of myself. This year, the goals I figured out from the 24 year old me is building. 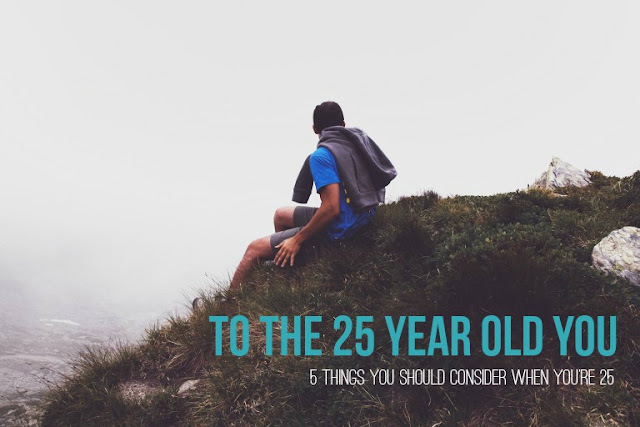 Here are the things I learned along the journey between being twenty four and twenty three. 1. LET IT GO – There are people who came into your life that you can't let go because you believe that friendship and those times spent together should be kept and cherished. You have a life mantra of “when quitting, think why you even started” ---- but that doesn’t apply to all. You can give yourself a break to this, if you have tried fixing your relationship and you keep on circling to the same situation, it’s time to let go. Remember that some people are not meant to stay in our lives (esp if they cause you too much heartaches and stress), some are just for visits to make us feel human. That is to make us feel hurt, loved, to love and learn. Thank them still, because through them, you keep on learning and knowing yourself. 2. CHERISH LIFE MOMENTS – We are caught building dreams and comply on the activities in our schedule that we are cramped up to have a life. Hey! You are just in your 20’s and it’s ok to have a balanced life still, so by chilling out with friends once a month is ok, it won’t break your dreams, actually it might even help! Stop living the past and worrying about the future. Take your mobile phones down and hang up to unnecessary calls. Live that moment right in front of you, be interactive on that moment. 3. SET A GOAL. BUILD AN EMPIRE – The only problem that we have in life is that we just don’t know where we’re heading and that makes most of the people bore about their job and current tasks. YOU NEED TO HAVE A DRIVING FORCE, A DREAM TO LIVE. Find your passion, set minor and major goals for the next few weeks, for the next couple of years and see them fulfill bit by bit, I tell you, it’s gonna be rewarding. 4. BEING SINGLE IS OK. (don’t panic!) – Your college friend is rocking his life already, a car, a dream house and their getting married or even expecting a baby, while you, you’re still ain’t got nothing, well ----just yet!. A moment to be single is a gift. This is the time to know more about yourself, to be free spirited and independent person. Your character is a gift to your partner someday, if you can’t fix yourself and chase for someone to complete you, you will never be completed because that person might someday leave you and you might get incomplete once again. 5. GET SERIOUS – This is your mid-20’s something, you are no longer that fresh young man graduate guy, you are about to be thirty soon and one day, you’ll be settling down. Give yourself some decency to pay for your bills and taxes by having a stable job and kicking career plan. This is not just for yourself but for your future family. Be that someone who knows how to enjoy life while being serious about responsibilities. Be independent. Be a provider. Drive that fancy car and live that dream house. Yes to all these wise words! I would definitely say these to my 25 year old self too. I like your points about being 25. You are a stable guy and know how to reason. That makes you awesome. God bless you, Steve! aw Mary, i never really consider myself as a stable man, hehehe. But thanks by the way and god bless you too! No. 1 - Totoo ito. May mga tagpo na gusto mo sana panatilihin ang lahat ng tao na naging parte ng buhay mo, pero hindi pala ganun. Sabi nga "people come and go", meron din namang maiiwan... yung mga umalis (maaaring sila o ikaw din) di ibig sabihin na dapat na silang kalimutan, may panahon din na magtatagpo pa rin kayo kahit saglit lang. No. 3 - Nung nakapagturo na ako, akala ko yun na lahat ng katuparan ng pangarap ko, pero minsan nabo-bore din ako. Kaya kailangan din talaga na may ginagawa kang iba o kahit paano ay may vision ka pa rin sa hinaharap; pinakamahirap sa lahat ay ang maalala mo palagi ang pinanggagalingan ng 'driving force' sa iyong buhay, kasi minsan ang buhay any nakaka-dry hahaha. N0. 4 - Nakaka-relate! Lately, puro kasal ng mga kaibigan o kaklase ang pinupuntahan ko, minsan gusto ko na itanong kung anu na ba nangyare sa akin? lol. But then, saya rin maging single pero masaya rin may kasama (mga friends ganun). 1. Yes, looking back before i felt that friendships and relationships are worth fighting for pero to yung mga tagpo gaing sa knta na "may oras na dapat lumaban at maghiwalay, pusoy lumaban man, walang magagawa" hahaha. Hind worth it mnsan. We should learn to choose our battle. 4. Oh yes, kahapon lang nakta ko post ng classmate ko my baby na, ako wala pang love life, like what the heck? pero ok lang yan, 20's pa, dont panic muna, Mahahnap din natin red string ntin hahaha. Very wise and practical goals from a 25 year old. Have a great day! Nice one! Reading this made me remember my 20s, which I really enjoyed. I enjoyed it more than my high school and college days. My 20s made me feel the real value of independence and having a clear grasp of my plans and dreams. I was in total control. Yes it's true when im learning so much about life now and independence and the worst part would be the pressure to get married hahaha. I'm 23, and have all of these worries! Maybe the people I feel I've lost were just meant to be vanished. Some did cause lots of stress. You know my dream with performing arts. I fell into the rabbit hole but have gotten much farther to the top the past year. Just need to follow through with my dream and pursue an empire (even if it's unrelated to dancing). I've found a great man and do hope things continue to go as successfully as it has, and we stay as happy as we have been the past year for many more. I've never been in love until this relationship. I've had previous long term ones, but loved them. Wasn't in love. These are great motivational tips for somebody like myself in their 20's! We may feel old but hell yeah we're still millenials! Yes that's true sean, well i hope that you create your own list too sw we, from 20's would understand the life of people in 40's and their life perspectives! hahahahaha. Yes, no pressure at all, after all we have our won life journeys right? we write our own stories, so no hush and bluffs for us! life isn't short. it's just time that goes so fast. i agree with all your list. Yes, you would really wonder why the times flies so fast and you would realize that you're almost there, so get some plans and enjot life at the same time. 25 is still young! Live every moment! Ow, hahahha, but i feel so old jackie. :( hahaha. Wow! Though I am not 25 yet but seems like this post was written for me. Please write more about it! Steve, this is so good! Such wisdom you've shared here, friend! Thanks Tai! I am trilled in reading more from your blog! A letter to a 25 year old me... mine would sound something like this too!